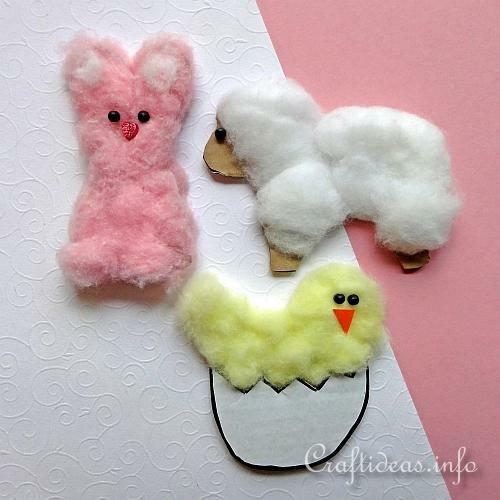 With some cardboard box sides and some cotton balls, kids can create these oh so soft Easter animals. Print out the pattern and trace onto the cardboard box sides. The egg should be traced onto a white cardboard box if possible. Cut out the animals and follow the steps below for the individual animals. 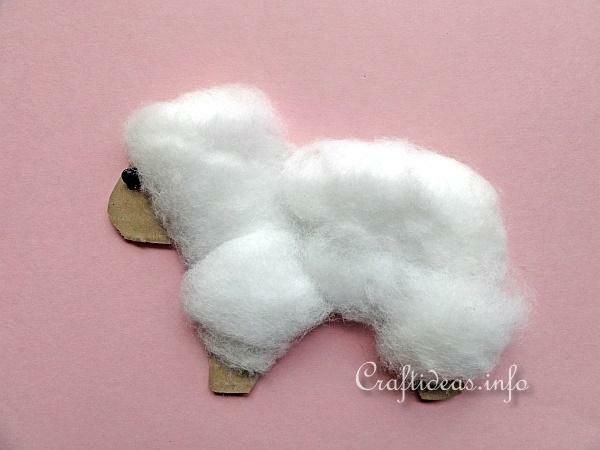 Stretch and flatten a few white cotton balls a bit and cover all but the face and feet of the sheep on both sides of the figure. If any cotton hangs over the side, just trim away with scissors if necessary. Then glue an eye on both sides of the sheep. First glue the chick body onto the the backside of the egg shape. Use the marker and draw around the outer edge of the egg to make it stand out more. 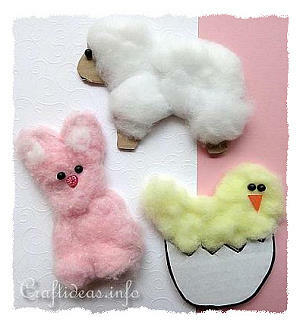 Then stretch and flatten a few yellow cotton balls a bit and glue onto the chick body. 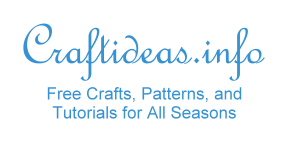 If any cotton hangs over the side, just trim away with scissors if necessary. 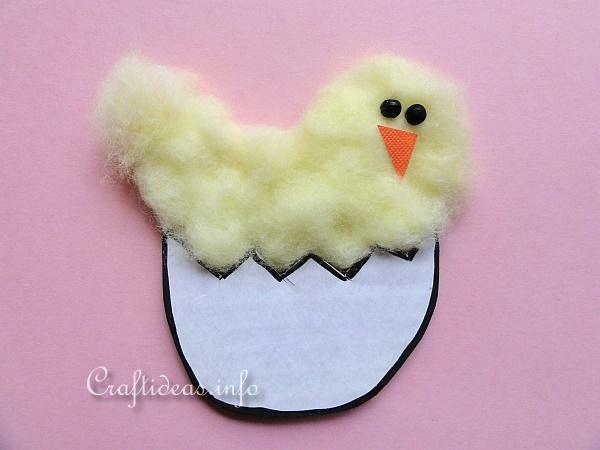 When finished, glue two eyes onto the chick and cut out an orange beak and glue on as the beak. 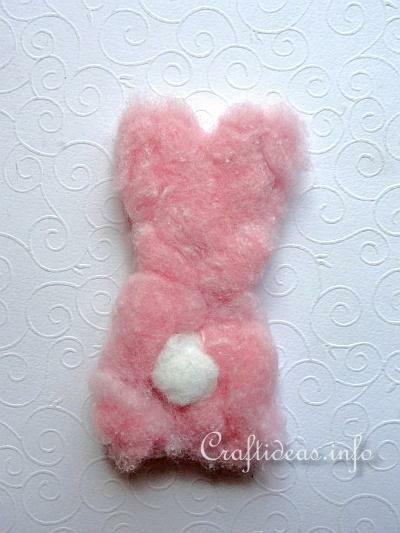 Stretch and flatten a few pink cotton balls a bit and cover the entire bunny body. Then take a small amount of white cotton and fill in the ears some. Also create a small ball out of white cotton and glue to the backside of the body as a tail. the face and feet of the sheep on both sides of the figure. If any cotton hangs over the side, just trim away with scissors if necessary. Then glue two eyes and if possible a heart nose onto the bunny. The little bunny is wagging his cotton ball tail.